ARTISTS & ILLUSTRATORS AUTOGRAPHS & AUTOGRAPH LETTERS. This category contains autographs, including letters, signed photographs and original artwork by artists and illustrators. The emphasis is on British artists of the 19th and 20th centuries but the category also includes artists of all periods and nationalities. 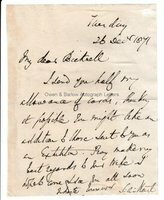 The collecting of artists' autographs is a field in which there are undiscovered gems to be found, as many artists were in the habit of embellishing their letters with sketches or doodles. 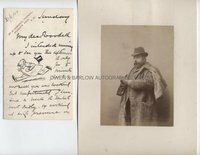 These have a charm all of their own and constitute an inexpensive way of acquiring original artworks by often eminent painters and illustrators. 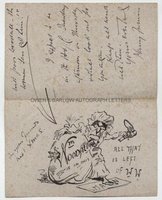 Scroll down for a selection from Owen & Barlow's stock of Artist's and Illustrator's autographs.